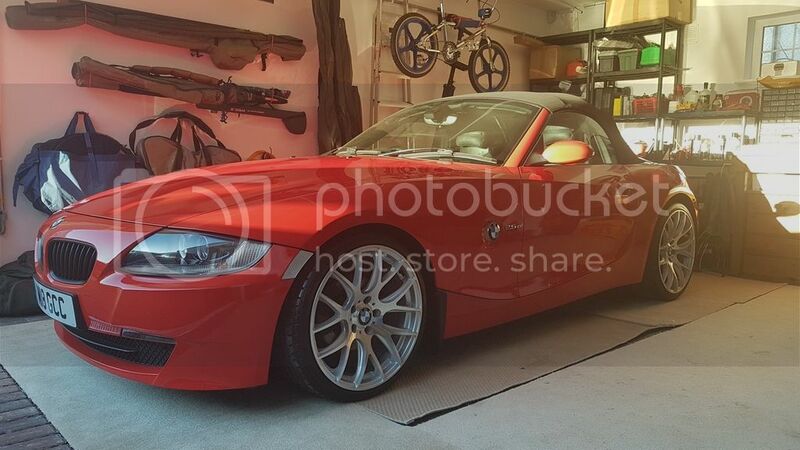 WELCOME TO THE SALE OF MY PRISTINE Z4 2.5SI IN VERY RARE HELLROT RED. FULL BMW WALLET WITH CARS DOCUMENT HISTORY, RECIEPTS ETC. I HAVE OWNED THIS CAR OVER 2 YEARS AND COVERED LESS THAN 2K MILES. IT LIVES IN A HEATED GARAGE AND HAS DONE ITS WHOLE LIFE. THE PREVIOUS OWNER USED IT AS A SECOND OCCASIONAL CAR AND I HAVE USED IT ON SUNNY DAYS OFF DURING THE SUMMER ONLY. THIS CAR IS GENUINELY PRISTINE. THIS IS THE LOWEST MILEAGE 2.5SI Z4 AVAILABLE AT THIS MOMENT THATS NOT SILLY PRICED. THE ENGINE IS SILKY SMOOTH AND IS MATED TO A 6 SPEED BOX WITH SPORT BUTTON. IT IS A DELIGHT TO DRIVE AND CAN ALSO RETURN LOW 40'S MPG. THE ROOF IS ELECTRIC, IN PERFECT WORKING CONDITION AND THE ROOF MOTOR IN A DRY WELL DRAINED STORAGE AREA. THE 224 M SPORT ALLOYS WERE REFURBED LAST MONTH, AND FITTED WITH BRAND NEW TYRES, NEW WHEEL STUDS AND STUD COVERS, FINISHED WITH MSPORT DUST COVERS AND MUDFLAPS TO COMPLETE IT ALL. I THINK I HAVE COVERED MOST THINGS, I AM A GENUINE HONEST OWNER AND WOULD APPRECIATE GENUINE ENQUIRIES ONLY. ANYONE REQUESTING FURTHER DETAILS ON THE CAR OR ITS HISTORY PLEASE CONTACT ME AND I WILL RESPOND AS SOON AS I CAN. Absolutely beautiful car. Love the colour. Hi. Whereabouts in the country are you? Also, is the car standard or have there been any modifications? Has there been any significant work/parts replaced during your ownership? Thanks for all enquiries guys. Didnt get time to respond to all of them. The car sold this morning.